Congratulations to Wendy @sevenwillowlane, giveaway winner! 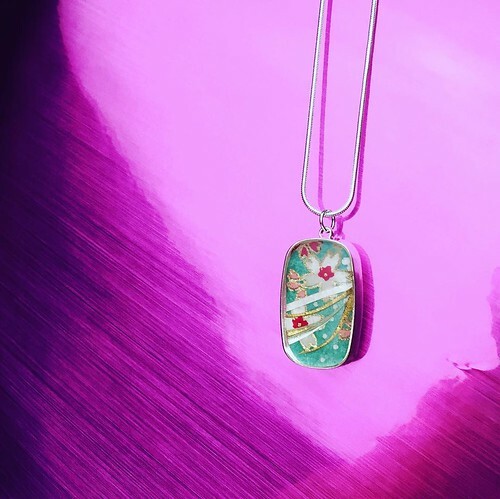 Not only do I love to wear jewelry pieces that incorporate pretty paper, but I delight in helping online creatives spread the word about their unique handmade products. Bashful Pineapple might be a bit shy, I don't know, but one thing is for certain... the resin, paper, and silver jewelry found in Christina Gelinas's shop is no shrinking violet. I'd wear any of her designs in a heartbeat! Read on to learn how to win a piece of your choice. 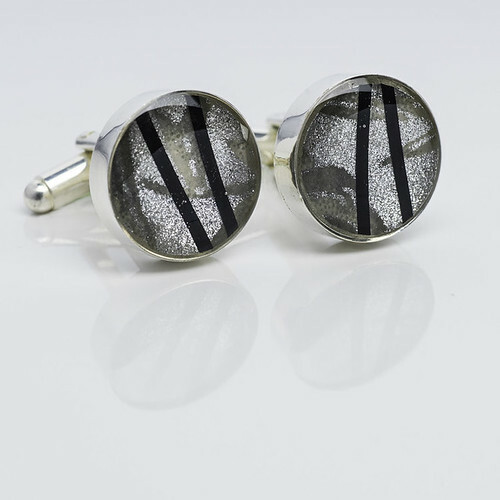 Jewelry artist Christina lives in Toronto, Canada and has been creating necklaces, rings, bracelets, earrings, and cuff links for ten years. 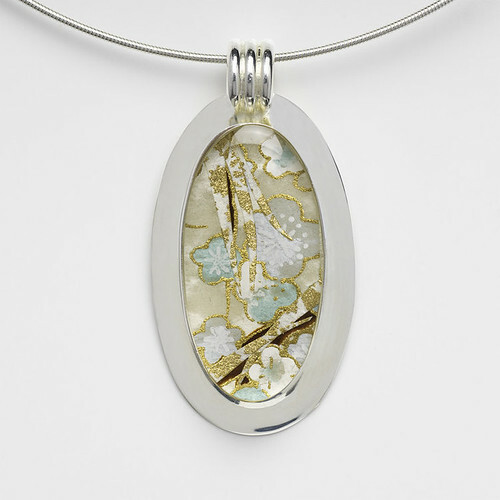 Six years ago she began working with resin. The distinctive silver-plated hardware Christina uses is sourced from Mexico where it is handmade at a community-minded manufacturing studio. Rather than embedding just one piece of chiyogami paper in a setting, Christina hand-cuts tapered strips of the same or a complementary paper and angles them across the smooth layer to create a collage effect. 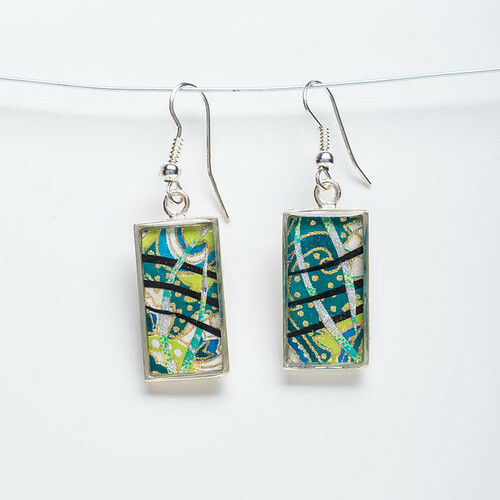 Christina enjoys making these one of a kind pieces and encases them in glossy resin as permanent, tiny works of art. She has been experimenting with metallic papers (actually a metallic adhesive film) and will be adding them to the site in the near future. And now the U.S., Canada, and U.K. giveaway! Two winners (one from blog comments and one from Instagram) will each receive a jewelry piece of choice from Bashful Pineapple. Shipping is included. This same giveaway is underway on Instagram. Enter at one or both places by the end of Saturday, May 5, 2018 to double your chances. Connect with Christina of Bashful Pineapple via Instagram and Facebook. And remember, Mother's Day will be here before we know it - May 13th. Jewelry is an ideal gift! This giveaway is sponsored by Bashful Pineapple. All lovely jewelry pieces. 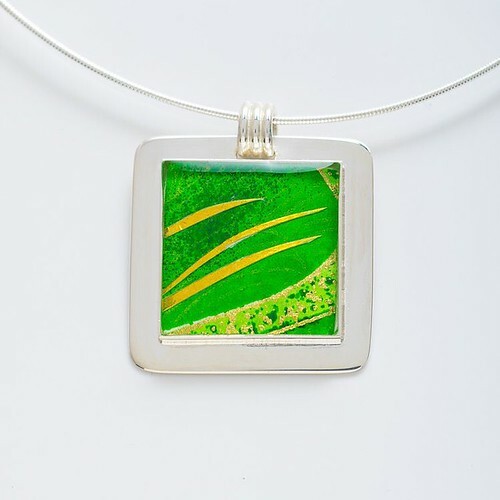 I think the Rectangle necklace in resin, paper and silver BPPLR00010 is lovely. So many that are great. I just looked at Bashful Pineapple’s site, and I am drooling! Everything is gorgeous. These pieces look almost like paintings. Todo lo que muestras en este blog es hermoso, tanto sea creaciones propias y de otros artistas. Ya coloqué tu link en donde me lo pediste. I'm glad you like them, Fi. If you'd like to enter the giveaway, you'll need to include your email address in your comment. beautiful!! tyriii [at] yahoo [dot] com thanks! I'm drawn to the stark black and white pieces on her site. Oh my goodness they are just exquisite. 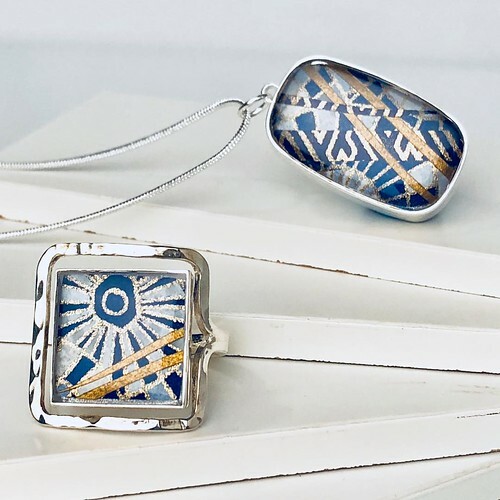 I love the pendants especially the long one and the oval one. Off to browse her beautiful pieces now.... marykaye7 at gmail dot com. Thank you for the chance to win. Great Blog. I work with paper also as a card maker. Your jewelry is stunning and I love it. I wish you well on your business! Wow! Beautiful works of art. I think anyone would be proud to own and wear a piece of this jewellery. Nancy Freckelton, did you want to enter the giveaway? If so, I'll need your email address within your comment, thanks. 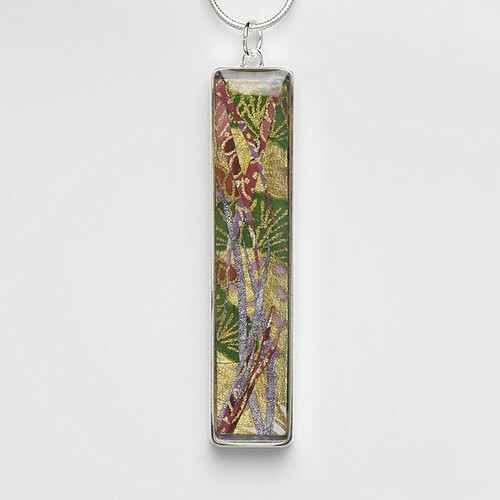 I love the selection on the site, especially the pendants. Such an eye for design and color. I would be thrilled to own a piece of jewelry from this collection. cyoshi5909 at aol dot com. 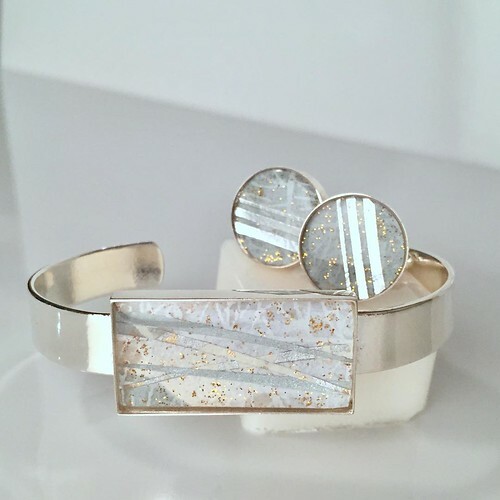 I love the colours in the RECTANGLE BRACELET IN RESIN, PAPER AND SILVER BPBS00001. lc2uv5m (at) gmail (dot) com. Beautiful paper jewelry. Like a lot of pieces. This giveaway has ended. Thanks for your enthusiasm for Christina's pretty jewelry! Stay tuned for another papery giveaway coming up tomorrow.